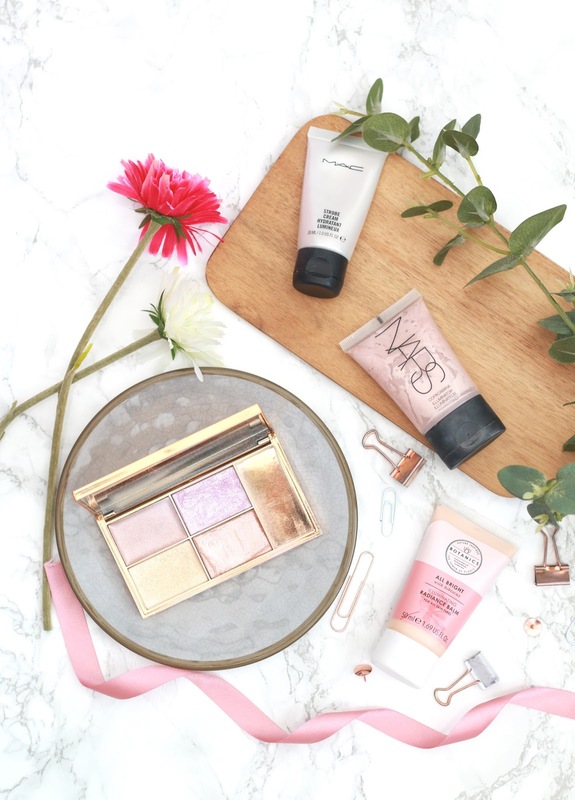 Even though the summer months are (sadly) behind us now, it doesn’t mean that the ‘glow from within’ look has to be behind us too. I much prefer a dewy makeup look over a matte one, and I’m determined to keep that going through the colder months. Pretty much all of the products included in this post are liquid based to pop on before foundation, but I think thats what gives you the real ‘inner glow’, if you will haha. The first thing I’ve been loving is the MAC Strobe Cream. I wanted to try this for a very long time, but didn’t want to splash out on the full sized/full priced one. So when I was at the airport on the way to Amsterdam this summer, I decided to pick it up, as it was only around £8 in duty free. This gives a really healthy glow underneath foundation, or you can just pop it on and add concealer, that works nicely too. A product similar to this, is the NARS Copacabana Illuminator. This is obviously very pink toned compared to the MAC Strobe Cream, which I think makes it a tiny bit more natural. Although it has much more of a sheen to it, which really brightens the skin up. This also looks beautiful dotted along the cheekbones as a liquid highlight. Next up we’re straying away from makeup a lil bit, and onto skincare. The Botanics All Bright Radiance Balm* is perfect for adding a natural radiance to the skin before applying makeup. Its much more subtle than the previous two, but equally as pretty and also good for the skin! Finally, a palette close to my heart (lol), the Sleek Solstice Palette. Every bloggers dream, I’m pretty sure of that. This doesn’t necessarily give you the most natural glow, but it certainly looks pretty. I think the most natural looking shade in the palette, is ‘Equinox’. A shade I will always go back to time and time again.